Well, we’re the only Arctic state, of course, Alaska. So we feel the impacts more than any other state, up there with the changes in climates. And certainly, it is apparent. We have erosion issues. And we have melting sea ice, of course. [….] You know there are – there are man’s activities that can be contributed to the issues that we’re dealing with now, these impacts. I’m not going to solely blame all of man’s activities on changes in climate. Keenlyside et al. initialised climate forecasts (and no, they didn’t take our bet). The “Gore Effect”. This combines the irrelevant confusion of climate with weather and the slightly manic obsession with Al Gore over the actual science. Do please grow up. Global warming is caused by undersea volcanoes (and pirates!). Dennis Avery: “Global warming is likely to continue” (2006) , to global warming is “unstoppable” (2006), to “Say Good-Bye To Global Warming And Hello To Global Cooling!” (2008). (Joint winners) 2008 near-record minima in Arctic sea ice extent, last decade of record warmth, long term increases in ocean heat content, record increases in CO2 emissions. The Australian (runner-up the UK Daily Telegraph). Both comfortably beating out the perennial favorite, the Wall Street Journal – maybe things have really changed there? The grown-ups being back in charge starting January 20 (compare with this). The axing of dedicated science units at CNN, the Weather Channel and elsewhere. Can Climate Central and blogging journalists take up the slack? Apparently 2 google searches produces the same CO2 as boiling a kettle. When pirates fall overboard above the continental shelf, they sink to the bottom and their peglegs poke a hole in it, releasing methane cthadrates(sp?). Has anyone noted that Mauna Loa observations actually showed a (seasonally adjusted) downward movement at the end of 2008? After a peak in Sept/Oct, the CO2 concentration went down by 1.3 ppm to 385.0 ppm. As far as I can see that never happened before, and it reduces the 2008 increase to only 0.2 ppm. I would expect mitigation of the rising trend by lower economic activity, but not this (although it’s a very short period). It would be an extremely desirable pause in which to take the right drastical political steps towards sustainable reduction of emissions. Uh, I’m not sure where the post you respond to says anything that disagrees with the state of oil exploration and production. “Demand” can increase all it wants, but if “supply” isn’t available (which you seem to agree with — it’s hard to tell), the imbalance is going to translate into either replacement sources or a change in pricing to reduce demand. You seem to be taking issue with my statements about biofuels production? You attacked me for knowing nothing about the oil industry (no one expects peak production greater than 85 million barrels per day (mbpd) — so I think you’re the one who knows nothing), but then went on to say something about biofuels and hydrogen not being there? Adam Smith’s invisible hand insures that neither biofuels nor hydrogen will be produced in large quantities until the demand is present as both are marginally more expensive than oil at the moment. I’m guessing that if OPEC actually sticks to the 2 mbpd reduction target that we’ll find out. I’m not waiting, I still have plans for an electric car either this year or next. When it comes to renewables, one of the greatest problems is that the US government (and IEA by extension) doesn’t really know how much is produced. TXU Energy, who provides me with electricity, hasn’t a clue how much I make, other than having a clue that it’s “a lot” because I don’t use so much of theirs anymore. As this article shows, each prediction about installed production seems to mysterious be on the very low side of wrong. I finished producing my 3rd megawatt hour (I should update my LJ, I suppose) earlier this month and that’s not accounted for anywhere — IEA doesn’t know TXU Energy doesn’t know, no one knows except me. And that’s the rub — each time there is a flurry of renewable energy development, more and more of the energy production falls outside the domain of “what is known”, and renewable energy installations continue to rise each year. However, what components of the climate play a part in the first 800 years of warming? It contributes indirectly via water vapour. Take the 180 p.p.m.v away and you change the threshold. No feedback. I doubt that hydrogen and electricity based cars in relation to AGW (the time factor you see) are viable alternatives in our world of what is needed. The present recession will limit the growth of oil for economic reasons of course but recessions are limited things and it will not take long before that 2 mbps cut is gobbled back up by the growing global economy and more besides. The Oil industry have discovered 45,000 fields and the big ones are the ones that have been in use for 50 years leaving slim pickings and a lot of expense to bring the remainging 1.2 trillion barrels online, 30 years worth if it even exists! Tar sands make up 200 billion barrels and that a joke, OPEC has being economical with their reserves due to commit to their pumping quotas and no one even knows if they are right in their alleged reserves and if they are not then its a problem. Hydrogen was a decade away a decade ago but also, its still a decade away technologically and by the laws of physics and not by the stupid invisible hand of Adam Smith. Pump all the reaearch money you want into this technology but as natural gas and coal are used as the main ingredients at the moment to make hydrogen you can see that electrolysis and the cost of hydrogen engines is presently prohibitively expensive requiring platinum in the fuel cell which cost a lot of money and featuring a whole load of other technical obstacles not least is producing it from renewables energy alongside all of the other electricity we need to do all ther other stuff fossil fuels presently do. When the technology is cracked and if it is Adam Smith style then its time to deplay and that a 50 year cycle to. Its the same issue for electric cars. Anyone know how to make tyres without using oil either, massive hurdles born of a energy source not created by man, just found ad therein lies the difference. if you have managed to tap a stream or some other renewable source for youself then great but it aint even in the same ball part of the needs of a nation such as the USA or China or a continent such as Europe. I am sure we can all downsize, rightsize etc on oil eventually when its price rockets post recession but the sheer scale and size of the problem is the daunting issue along with the laws of phyics at the moment. Hope you produce 100 MW and feed a few townes, T Boone pickens is trying it and I am sure all the motor companies are too but as yet no breakthroughs, only wind and potentially solar and CSP at the present time whcih require a lot of expense and new grand plans whci at present do not exist either. Roll on Denmark later this year when the new president of the USA and the rest of the world can finally commit to comitting themselves to something big. James Hansen reckons that it all down to eliminating coal by 2030 and maybe we can do that if we deplay turbines, CSP, other renewables and replace the existing grid with smart one. Then we crack the oil problem and need the same amount of electricity again to power our cars, hell knows about the trucks and freight as yet, not answer there and as for flying – biofuels eventually could do the job but lets not presend we do not have large looming problems and just reckond that its a peice of cake for as yet it aint is it ? Ark. I think a simpler explanation is an error in the presentation of the data. The graph does not have a data point for Dec and checking the data file shows a duplication of the Nov figure. I think you’ll find a new Dec figure soon. The detrended plot and the 2008 result will then look more normal. iso, you ask “what components of the climate play a part in the first 800 years of warming?”, giving several possible answers. Since I love multiple choice, I will say that the generally agreed answer appears to be A), insolation, adding that the change in insolation is attributed to periodic orbital changes (Milankovitch cycles.) I think that is an FAQ around here somewhere. Not in my opinion. When the automobile was invented, do you think they had a ‘grand plan’ ready for highways and parking garages, etc.? No, it was just a matter of getting started and then gradually expanding, adapting the infrastructure along the way. The same is true for renewables, it is a matter of getting started and solving the problems and improving the technology along the way. Some things of course must be planned in advance, but requiring a ‘grand plan’ reminds me of the communist 5-year plans, which were usually monumental failures. How do you define ‘the same amount of electricity’? Joule for Joule? An electric car is much more efficient, achieving around 6 km/kWh, or 600 kJ/km. An average (smallish) car does 7 l/100 km, which is ~2.5 MJ/km or four times as much. By switching to electric, we can therefore slash the road transport energy consumption by 75%. Energy consumption for freight in the UK is a third of all road transport energy use. I think it will not be much different from the rest of the world, so it’s not as big a problem as it may seem. Re #262, Every underestimates the energy density of oil I guess. A gallon of oil is 43 KW/H of energy. Sure we can make everything lighter (what replace 850 million vehicles in the world at present, well yer) and more efficient and batteries don’t weigh anything do they or litter the planet as they are easily recyled and dealt with. That was beauty of oi, gas and coal, there was enough of it and it was energy dense enough to allow the world to grow but when you are there its a different story as to what replaces it and allows continued economic growth for ever and ever, amen eh. There is some very good stuff out there but it aint here yet, sure efficiency gains for future buildings and transport might be able to be adjusted as you are saying but is is scientific/engineering reality or just a missions statement of someone who does not really know? Its all in relation to AGW and probably peak oil. Our need is to replace coal and risk using up all of the oil and gas slower by making it last longer by introducing hybrid technologies to make it more efficient. If we leap that obstacle and eliminate coal usage by using large scale renewables energy projects and efficiency gains then cool. However its 2009 and as yet it seems to be non existant as oil, gas and coal usage are only presently going down a little due to the current recession and that itself is probably hurting alternatives as well from getting a foothold in the economy. When the recession recedes so the fossil fuel commitments will grow again. Hence the need for a plan in my book. Hence hopefully Copanhagen at the end of 2009 to determine the new Kyoto and hopefully the USA taking part in full and weening them over to and off of the CO2 emitting stuff by 2050. LEts hope we have the time to do it, it seems like a close thing though. Germany has made some good progres towards electricity from solar and wind and maybe its a good working example of what everyone can achieve, lets hope so but Germany is still planning on building new coal fired power plants without CCS as yet. Uh, yeah, because the water would have frozen out too; you’d have a dry atmosphere, nitrogen and oxygen and argon, eh? I’m not sure what you’re trying to say. I am not underestimating the energy density of hydrocarbon fuels. I am talking about real world data. Real electric cars. Real gas cars. It’s unavoidable math. Besides, everybody knows that an internal combustion engine in a car is, on average, 20% efficient. Electric motors are around 80-90%. I stick to my point: electric transport will use 1/4 of the electricity (in Joules) as we are currently using on gas (in Joules). Certainly better than ICE vehicles but there are issues with over all delivery considerations of electricity and other limitations such as the size of the vehicle. On the whole though a good thing but 24% efficiency overall is only 4% better than ICE unfortinately. Thanks for the inofrmation though. It all does sound very promising but some issues seem to be in the grid system. Roll out the renewables though and it might be a ICE replacement at some point in time. The Annual Mean Growth Rate shows 1.82 for 2008. I was supposing the electricity would come from renewable sources. Only that way an electric car really makes sense. The 20% efficiency excludes losses of refining, something that will progressively worsen with increasing use of tar sands. Biofuels is no different. It’s more efficient to burn the biomass directly in a power plant than to refine it into something that is fit for a modern ICE. I still shudder at where exactly we get our replaced electricity from (coal and gas based) and then add enough to repalce oil to. It all seems slightly out of reach to me. Still I presume that the efficiency of this electric car will come from direct electric cars and not hybrid types. It all sounds like we need something in the region of 125 MPG eventually otherwise the planet will be covered in Wind Turbines, no ? Since CO2 cannot contribute to a changing temperature unless its concentration changes, I thought it maybe plausible to compare the rate of warming, before and after changes in CO2 levels, using ice core data. There is no significant difference in the rate. *Is it because CO2 is already contributing? (Tried that arguement). *There is no change in rate because rate is limited by……..
*Overlapping forces (#238), or there is a delay? *Water vapour is responsible for most of the warming? There must be a scientific explaination. If CO2 is so critical to the temperature of earth, you’d expect an increase in the rate. Feel free to shudder all you want. I get a lot of my electricity from my roof. Pretty soon I’ll walk to the garage and get on my electric motorcycle that also gets a lot of its electricity from my roof. Really. Putting your head in the sand will not keep people from shifting off of liquid fuels. It will get sand in your eyes and that’s about it. CO2 has already contributed to retaining warmth. Your statement is begging several others and you have worded it badly. Water vapour has already contributed to retaining warmth and its contribution is higher than the CO2 concentrations. However, unlike CO2, we have rain, so it only stays up there if the temperature allows it. It cannot contribute to a forcing. If you pump trillions of tons of water in the air, it will rain out. If you pump trillions of tons of CO2 in the air, it doesn’t (unless you’re on Ganymede, maybe). Rate of what? Why would we expect to see it bigger? Bigger than what? Why would it increase? If I push a block of metal in a zero-friction assembly, it will speed up until I stop. It will CONTINUE speeding while I push with constant force. The rate of change doesn’t increase just because I’ve been pushing for half an hour rather than 4 minutes. your questions go unanswered because your questions make no sense. re 269. However, that Honda has to carry two engines and bigger batteries than the diesel. And it isn’t an electric car. It’s a hybrid. Gavin, is it because of the clouds? The rate of warming is limited by clouds? iso, read the pointers given to you above. There’s not enough precision in ice cores to see whether what you’re assuming is true. You wish there were. But you can’t ask your questions based on what you wish were true and expect answers that make sense. Isotopious, You are looking on this as if changes are occurring one at a time. That’s not what is happening. First you have a change in insolation due to a change in Earth’s orbit. This raises the temperature to the point where you eventually get outgassing of CO2 from the oceans, permafrost, etc. However, all the while insolation is changing as well, along with albedo, etc. What CO2 does is extend and intensify the warming. No responsible climate scientist has ever said CO2 was all there was to climate–it just happens to be how we’re warming Earth at present. Couldn’t agree more, Ray. Very complicated. re 274. the rate of increase in warming would be due to an increase in the level of forcing. If CO2 output isn’t increasing then the rate of increase won’t increase (given everything else is static). So why do you think the rate of warming should increase? The temperature is increasing but not the rate of temperature increase. At least not to an extent that can be ascertained. Just like pushing a car will make it go faster and, in zero friction, continue to do so but the *acceleration* isn’t increasing. And it never will unless you increase the force. Re #271, thats a slightly emotive response in my book and you may live in a part of the world where solar can supply you all year round but a lot do not I am sure. I too have switched to the new light bulbs but its not made a big difference to my electricity bill as yet (if it ever will) although it may have to my consumption. And as for electric motorcylces, dream on. In actual fact that statement says it all for the masses and just adds to the despair. Families of 5+ are not going to be using bikes to get around and hence like James Hansen says, its all of the oil and probably all of the gas we just have to tackle the coal. I was hoping that you had some radical energy ideas and knowledge but alas, you have some individually good incentives and practice but nothing for the masses. Many obtacles prevent energy efficiency and new technologies from taking off. Energy leaky houses that require a lot of incentives to patch up and will can potentially cause other issues. Solar thermal and solar water which for millions of homes are presently prohibitively expensive and every time fossil fuel bills rise governments do not seem to do anything constructive but talk to the fossil fuel companies rather than help pay for the alternatives. As for transport, we aint going to see A en masse movemtn of electric vehicles anytime soon but I hope you are right and the USA moves ot hybrids, 20 MPG to 60 MPG would be a very good thing, is it likely though ? Sorry about giving you ther wrong impression but I thought it was a reality energy conversation and not a optimists charter for an individual. Re #273, I said it was a hybrid but she sounded like it was 80% efficient over 20% and hence 4 times the MPG. Its nothing like that is it overall but we may be talking from two seperate continents where in the USA hybrids might be sounding like a machine made in heaven whereas in Europe it sounds like its a good vehicle but 60 -70 MPG already exists in diesel form. I don’t have a family of 5+. I have no reason to have an electric SUV. However, if I needed an electric SUV, or a larger electric car, I know how to get one. Re #281, cool, and powered from your solar syaten no doubt to. Phew, that AGW solved then. Compressed air cars too. Little engine and a lot of power from a compressed air tank from using some electricity. 1000 mile range. in Europe it sounds like its a good vehicle but 60 -70 MPG already exists in diesel form. Remember, diesel’s about 20% more dense than gasoline to your 60-70 MPG TDI diesel is equivalent to a gasoline car getting 48-56 MPG in terms of carbon emissions (only). I have a great idea, let’s all fuss over little gains from individual choices in rapidly depreciated automobiles, instead of taking the big basic easy steps toward conservation. What’s that about, if not confusion, uncertainty, and delay? Eight US utility companies call for tougher transformer efficiency standards 2006-11-02 08:30. … Distribution transformers in the USA currently conform to the energy efficiency standard NEMA TP-1. This is a voluntary industry standard, set by the National Electrical Manufacturers Association (NEMA). Last August, the federal Department of Energy (DOE) released a proposal for an efficiency standard for distribution transformers that goes further than the NEMA standard. According to the Energy Policy and Conservation Act, the DOE is authorized to establish energy conservation standards for various consumer products and industrial equipment. Surprisingly enough, eight utility companies have stated that the DOE proposal does not go far enough. These companies argue that the DOE proposal does not set the minimum efficiency standard at the estimated minimum life cycle cost (which is calculated by the DOE itself). They want a tougher standard that would at least minimize the life cycle cost of the equipment. The eight utility companies side with several energy efficiency groups and consumer advocates. They argue that more efficient distribution transformers would benefit the US economy as a whole. Over a period of 28 years (the mean life expectancy of a distribution transformer), the tougher standard would save 459 billion kWh, or 50% more than the DOE proposal. That means a net savings of $11.1 billion, or $1.7 billion more than the DOE proposal…..
“In 2007, the Attorney General also filed a petition PDF logo [PDF 7.77 mb / 61 pg] in the Ninth Circuit challenging DOE’s failure to adopt a stringent efficiency standard for electricity distribution transformers. Distribution transformers, mounted on utility poles or small concrete pads, reduce the power of electric current from the high voltages used in transmission lines to the lower voltages suitable for use by residential and commercial utility customers. More efficient distribution transformers significantly reduce the amount of electricity that is lost in the transformation process, and therefore reduce greenhouse gas emissions associated with power generation. The Attorney General filed its opening brief PDF logo [PDF 2.95 mb / 82 pg] in the case on June 26, 2008. Get this? It’s one agency. One regulation. One line of text. Utilities and states have had to file lawsuits trying to require the best off-the-shelf efficient technology to maximize economic return on the investment — the DOE mandated cheaper, less efficient standards. One line of text. One agency regulation. One rule — affecting more efficiency savings than all the little stuff getting so much attention. Where did you ever hear about this? And we’re fussing about who drives what kind of stupid car? When I switched to CFLs, my electric bill dropped 15 percent immediately. Furthermore, I now have the option of paying an additional 1-2 percent to purchase green energy through my power company. Which is being heavily promoted by the power company as well so it is not simply an “individualistic” thing. Re #286, 284. I hope that the public understands the difference on car technologies in realtion to the climate. Diesel is a bit dirty it has to be said on its particulate emissions and the stuff on wiki about electric cars demonstarte that the future is this way or oompressed air maybe. Its good to see that the options are coming and so are the cars. Lets hope we have the clean electricity sources to power all these electric vehicles. SHould not a big issues in the USA, nor in Europe for that matter. Fills me with a good vibe. Yes, diesel has been quite dirty. However, in the past couple of years new diesel fuel and new diesel engines are much cleaner with regard to particulate emissions. 1)The taxi funeral–complete with casket sticking out of the back-seat window. 2)The bicycle funeral–two guys riding in synchrony with a casket attached to the luggage racks on the back of the bikes with bungie cords! Amazing what people will come up with when they have no limited options. “… a UK-based team now reports that under normal conditions, plants just convey methane from the soil to the air without actually producing it. “With one exception. By refusing to even consider the possibility of an extended solar lull, Hathaway himself can avoid having to address the impact that such a lull would have on global temperature. If he did address that question, he would obviously have to note that the last really long such lull seems to have caused the Little Ice Age, which would place him on the side of the “deniers” in the debate about human-caused global warming. If low solar activity caused the Little Ice Age, then the “grand maximum” levels of solar activity during the 20th century would be the cause of 20th century warming, and the hoax of human-caused warming would be exposed. Looking at the science alone, however, Hathaway cannot be lumped with the IPCC. Most importantly, there actually is a solid body of evidence behind his predictive scheme. Past solar cycles HAVE tended to follow a particular pattern, where the shape of the up-phase predicts the shape of the down-phase. In contrast, there is no evidence whatsoever for the theory of human-caused global warming. In theory, additional CO2 should have SOME heat trapping effect, but there is no sign of it in the geological record. What warming effect CO2 has is evidently too small to measure, and this is just what we would expect. The linked blog is good for a chuckle. Scroll down beyond the “recommended” links to the usual places (WUWT, Heartland, etc.) and you’ll find a link to “the Real Frauds at RealClimate”. “Doc”, what happens if you increase the density of a medium wherein a particle is moving by random collision from the centre to the edge? It takes longer to get out. Now, since input is in joules per SECOND, and the reradiation is in joules per SECOND, what do you think will happen when the joule takes longer to get out? Here’s a hint: the joules per SECOND goes down. Perhaps the sceptical side of the argument could be permitted to nominate some candidates for the most outstanding elephant in the room, ignored in the original text. The obvious candidates are the UAH records, with the lower troposphere decadal trend at 0.13 degrees, and the mid troposphere at 0.04 degrees C, results which are simply not compatible with the high atmosphere AGW absorption theory. However, Gavin blames corruption from the cooling trend in the stratosphere for the mid troposphere result. The Hansen forecasts are worth nominating (diverging B line temperature forecasts and actual C line temperatures), but if you choose your start point carefully (the immediate post El-Nino point) the temperature trend is still upwards. 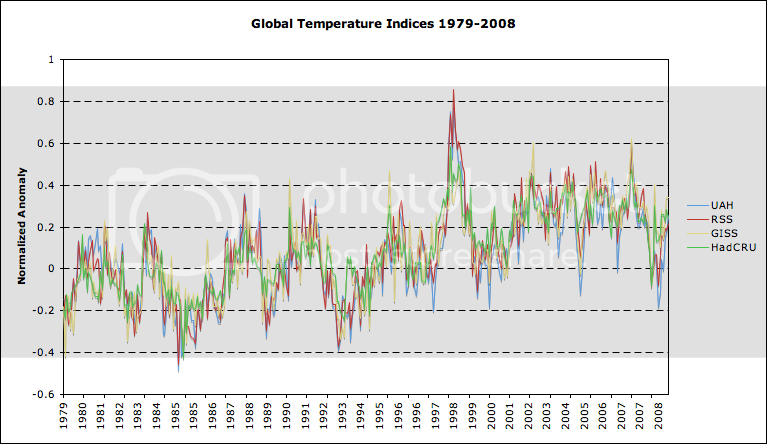 The bias inherent in the ground station temperature measurements reported by Anthony Watts is a very strong candidate. I particularly recommend “ How not to measure temperature, part 79, NOAA USHCN COOP weather station #298107”. In my opinion, though, the nod has to go to the HADAT radio-sonde records from the Hadley centre, plotted with the corresponding CO2 record at “Global Warming at a Glance”. It is difficult to see any AGW effect in the plots, at all altitudes. The temperatures fall from the previous peak in the forties to the late seventies, in contrast to the rise in CO2 over the same period. There is a sharp step increase at the end of 1977, and a flat trend thereafter until the El Nino peak in 1998/99, another step from 1999 to 2001, followed by a decline back towards the seventies levels. The individual data records for the troposhere levels are well worth looking at. They confirm that the temperature trends from 1958 to September 2008 fall with altitude across the troposphere, from 0.16 degrees per decade at the lowest level to 0.13 at the top. Importantly, the trends from 1979, lower and upper, are very close to the UAH Northern hemisphere lower and mid troposphere trends, and most of the Radio-Sonde sites are in the Northern Hemisphere. On the Fred Staples stuff, it’s the same old stuff. People get tired of helping Fred try to cite sources, because it’s never easy to come up with actual science to match what he claims, and he reposts the claims everywhere. This is how folks get the last word — by repetition without alteration despite attempts at education. I’m tired of chasing the stuff down. Someone want to write some software to find it all and collect it in one place? Then we could look for a pony. Amazing how it goes away when you normalize everything to the same base period. Kudos to Zeke Hausfather for the plot.